As part of its extremely considerate effort to spare the citizens of Loudoun County the trouble and frustration of having to inform themselves about local issues, take time out of their busy schedules to present public comments, and then endure the disappointment of having their views summarily ignored by their elected representatives, our new all-Republican Board of Supervisors swiftly approved a series of measures in its first few meetings in January, voting 9–0 with no public notice, comments, or discussion, to pass a nice package of initiatives sought by the developer and road builder interests who funded their campaigns. Among these was an amendment to the county transportation plan to expand to six lanes a segment of current 2-lane roadways—Belmont Ridge Road and Northstar Boulevard—that just happen to line up with the longstanding plans of the Northern Virginia Transportation Alliance and other developer lobbyists for an Outer Beltway running smack through our county. The Board was so keen to get this done before anyone noticed that they put it on a special fast track; the Planning Commission approved it 9–0 ten days ago and sent it to the Supervisors for final approval this week. But a funny thing happened on the way to the rubber stamp. 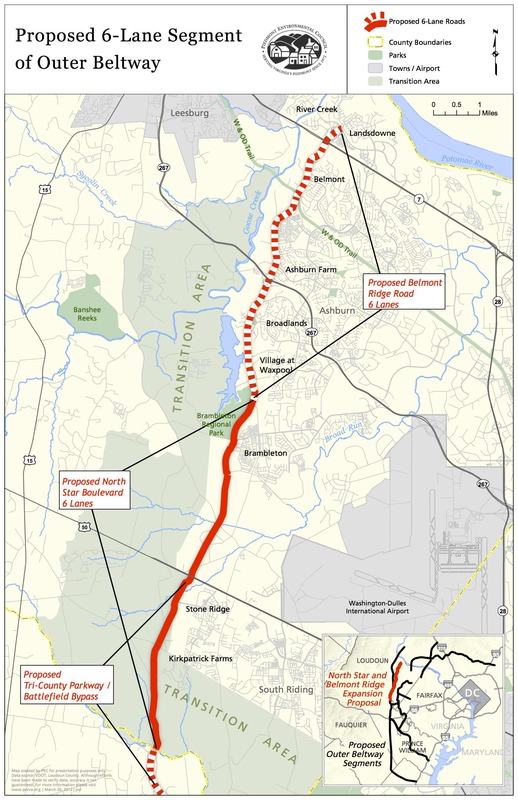 On Tuesday a large contingent of rather irked neighbors of the proposed highway showed up to denounce the plan; many took aim at that the bogus claims for why we need this road offered by the lobbyists who spoke (and who tried to insist with a straight face that it had nothing to do with the Outer Beltway). More than 100 comments were also received by the Board by e-mail as of Tuesday afternoon, all but 1 opposed. The rattled Supervisors have now put off a vote until May. Maybe the citizens who were asleep back on Election Day are starting to wake up!